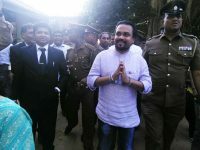 It is reported that the request made to get all three meals from his home by National Freedom Front (NFF) Leader MP Wimal Weerawansa who has been remanded for misusing vehicles belonging to Presidential Secretariat during Mahinda Rajapaksa regime has been granted by prison authorities. The Prison Department media spokesman Thushara Upul Deniya said a request made by Mr. Weerawansa’s wife to bring food was granted as it is a privilege for any prisoner. Again special treatment for the pariahs in the prisons. Nothing but traitors who have swallowed the national wealth and the tax payers are paying for it. The traitor who crossed party lines to strengthen the hands of Rajapakse bandits.